Bhubaneswar, Nov. 22: India must put emphasis on basic research if it has to emerge as a major knowledge power and Indian universities must fire the power of imagination of students to make them think beyond the books, former President Mr. Pranab Mukherjee said here on Wednesday. “Because of our lack of emphasis on basic research, institutions of higher education in India have lagged behind others in the world. 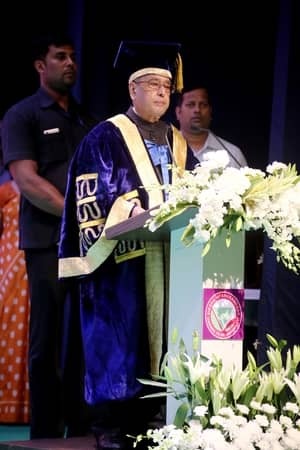 Without such focus, it will not be possible for us to have our coveted place in the comity of nations,” Mr. Mukherjee said while delivering the 5th Convocation address of the Siksha ‘O’ Anusandhan (Deemed to be University). Describing research as the cornerstone of academic endeavour, he said its quality determined the academic caliber of an educational institution. “Indeed without strong research programs, no institution of higher education can truly accomplish its central mandate of promoting learning and knowledge,” the former President said. This explains why none of our universities have found place in the list of top 200 such institutions of the world, he said while expressing regret that no other scientist working in India had received the Nobel Prize after C.V.Raman. “I don’t agree that Indian students are less intelligent or there is any dearth of talented teachers. Indians like Hargobind Khorana, Subramanyan Chandrasekhar and Amartya Sen became Nobel laureates while working in foreign universities,” he added. “The institutions of higher learning must realize that a scientific temper, which takes one’s imagination beyond the realm of grades and class rooms, is essential in our students. Our universities must fire the power of imagination of their students and the teachers make them think beyond the books so that they are trained to accept a proposition only after investigation,” he said. Heaping praise on SOA, a 10-year-old Deemed to be University, for having been identified as one of the most promising centres of higher learning in the country today, he said it was highly commendable for the young university to figure among the top 20 Indian universities as listed by the National Institutional Ranking Framework (NIRF) of HRD ministry. Expressing happiness over SOA being known for its high quality professional education with emphasis on research, Mr. Mukherjee said the quality of research, the cornerstone of academic endeavor, determined the academic caliber of an educational institution. He congratulated SOA for laying visible and sustained thrust on inter-disciplinary research by establishing the Centre of Excellence for Theoretical and Mathematical Sciences and conducting research on nano particles, multi-functional materials and thin film-based censors at the Centre for Nano Science and Nano Technology. Chancellor of SOA, Prof. Khageswar Pradhan presided over the ceremony which was graced by former Chief Justice of India, Justice K.G. Balakrishnan, former union minister, Mr. M.Veerappa Moily and Head of the National Cancer Institute, AIIMs, Delhi, Prof. Goura Kishore Rath. The Vice-Chancellor, Prof. Amit Banerjee and Registrar, Prof. B.B.Pradhan were present. Justice Balakrishnan, Mr. Veerappa Moily and Prof. Rath were presented with honorary doctorate by the university on the occasion. Forty degrees of Ph.D., two Chancellor’s Gold Medals and 39 University Gold Medals besides degrees to 323 Post-Graduate and 1950 Under-Graduate students were presented. The Vice-Chancellor Prof Banerjee, in his report, said the SOA, which already had 12 research centres, was in the process of establishing a dedicated Centre for Environmental Science and Climate in collaboration with the Indian Meteorological Department. Siksha ‘O’ Anusandhan, also known as SOA, has been placed 20th in the country among the top 100 universities as per the rankings conducted by the National Institutional Ranking Framework (NIRF), Ministry of HRD, in April 2017. It is also the youngest among all universities who have found place in the top twenty of list. This is also the second successive year that SOA has found a place among the top 20 universities of the country chosen by NIRF. The National Assessment and Accreditation Council (NAAC), which has termed SOA as socially inclusive, has reaccredited it with 'A' Grade. Nine degree granting institutes are constituents of SOA which has a student strength of around 10,000. The institutes impart education in disciplines of engineering and technology, medicine, dental sciences, pharmaceutical sciences, management sciences, nursing, law, hospitality and tourism management and agriculture. Institute of Technical Education and Research (ITER), faculty of engineering and technology of SOA, has become the fourth institute in the country to get three of its programs accredited by the prestigious Accreditation Board for Engineering and Technology (ABET), USA. Apart from SOA, only three universities in India have received ABET accreditation.